This week, I have mostly been writing tweets. Facebook posts too. I have been working on how to convey my message as clearly and succinctly as possible to support and promote the #StandUp4Brixham campaign – and generally it’s working pretty well. 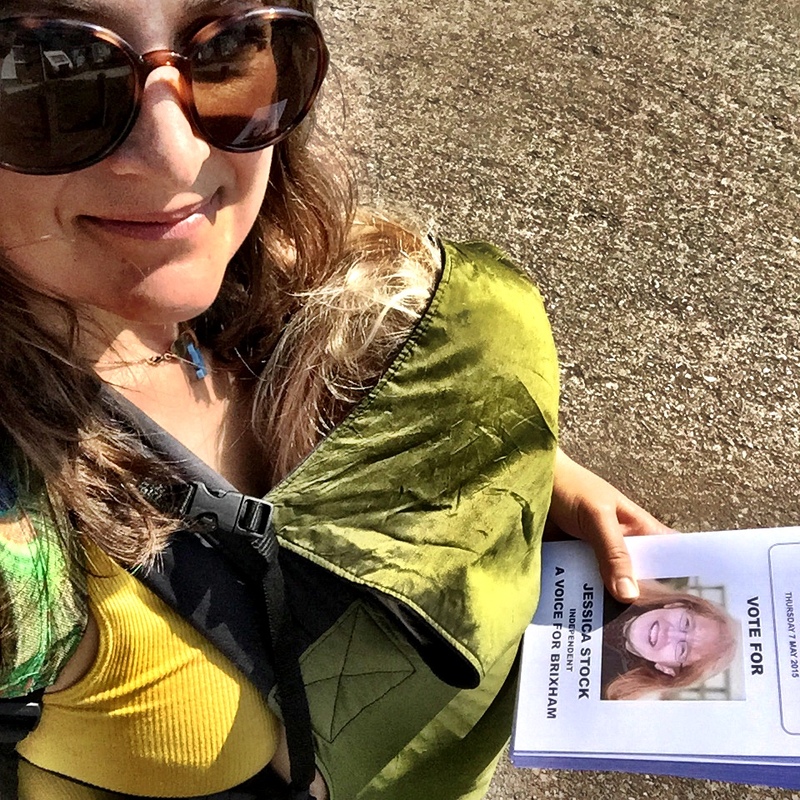 There’s been lots of work on the ground as well – since my leaflets were completed last Wednesday afternoon my iPhone estimates I’ve covered about 30km going door to door with Arthur in the sling. There was a meeting last Tuesday evening that Arthur also had to come to, and on Saturday we had a hustings event to talk to members of the public. It’s been nerve-wracking getting out there and speaking up, but I’ve enjoyed it too. The social media side of things is an attempt to engage with people who might not normally be interested in local politics. The campaign has a growing Facebook page and twitter account with nearly 200 local followers between them. I’ve appreciated the support of local businesses with more established accounts sharing and retweeting my posts. And one of my tweets attracted the attention of my local MP and ended up in the paper. So far so good as far as profile-raising goes. But there has, perhaps predictably, been a less pleasant side to putting myself out there. It started with the comments at the end of articles on the local paper’s website, where amongst other things I was labelled a ‘rather sad individual who spends all of her waking hours gratuitously criticising [the leader of the Abolish Brixham Council group]’. Other commenters leapt to my defence, but it was a strange feeling to be insulted and accused of something I haven’t done by a total stranger. The tweet which sparked all this off – and more besides – was a link to a letter which had been published on a local news website. I really wasn’t expecting it to be so controversial. There’s a lot that is strange about the accounts in question – the similarity between their names and the lack of followers for example. Were these exchanges happening on my personal account then I would not hesitate to block and report them. But I’m not sure exactly how I’m supposed to respond in my current role as council candidate – I am obviously very keen to engage with interested Brixham residents, but I have to admit that these communications are beginning to make me feel uncomfortable. I realise as well though that, on the grand scale of things, there’s not really anything desperately offensive going on here. Twitter does seem to be a place where some people hide behind a mask of anonymity to behave in a way that they never would face to face. So I will soldier on, draw on my years of experience working with challenging teenagers, and try not to take it too personally. One of the things it is clear could be improved about our local council is the quality of its communications and its transparency in working with people in its community. And I refuse to be intimidated out of my attempts to do just that. 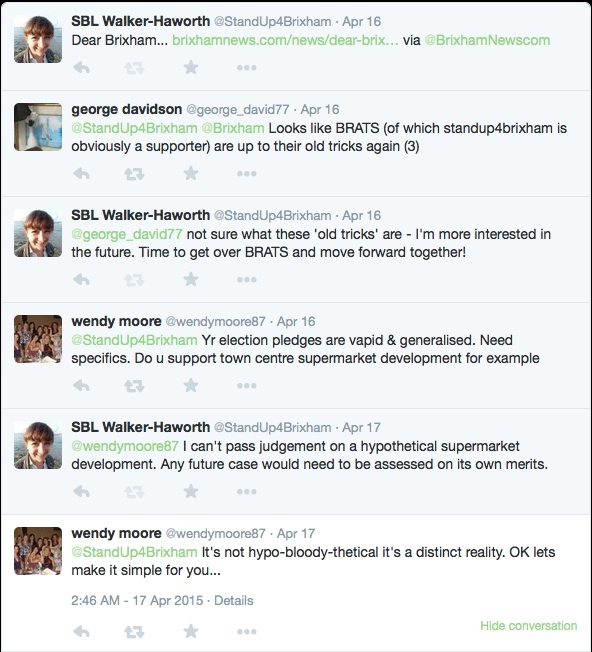 This entry was posted in Sophie is pondering, Sophie loves Brixham and tagged ABC, Abolish Brixham Council, brixham, election, election campaign, local council, politics, social media on April 20, 2015 by sophieblovett. When it comes to politics, you are always going to come up against strong opinions and people who don’t mind raising them. I guess it goes with the territory and its a case of ignoring it and developing a thick skin. Keep up with your message and don’t get involved in any of the nastiness. I think if you’re entering a public world of politics, then yes, developing a thick skin is a must. I do feel that people find it easier to say things online that they would be unlikely to say face to face-and this isn’t always a good thing sadly. Good for you putting yourself out there and getting involved with things that matter in people’s day to day lives. I can only echo the others here by saying these arguments often come with the territory. Social media means we can express ourselves more widely than before, but so can other people! Shrug off the negativity – local politics and writing both require that thick skin! You should not take it personally and brush these comments off.